You know how the mere mention of ice cream brings huge smiles and jumps of joy from kids? At least that’s what happens at my house. Well, sculpey polymer clay is kind of like that in art form. 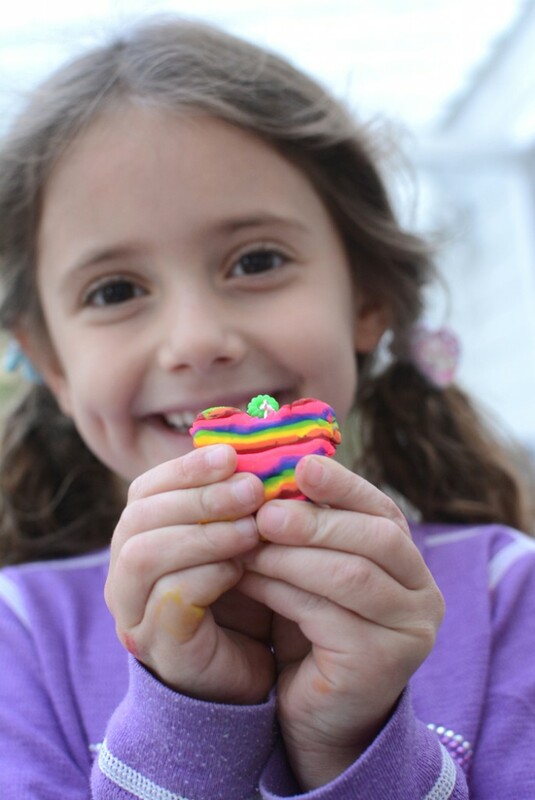 Kids love it so much that whenever I need to recharge my art class battery, I always go to sculpey. 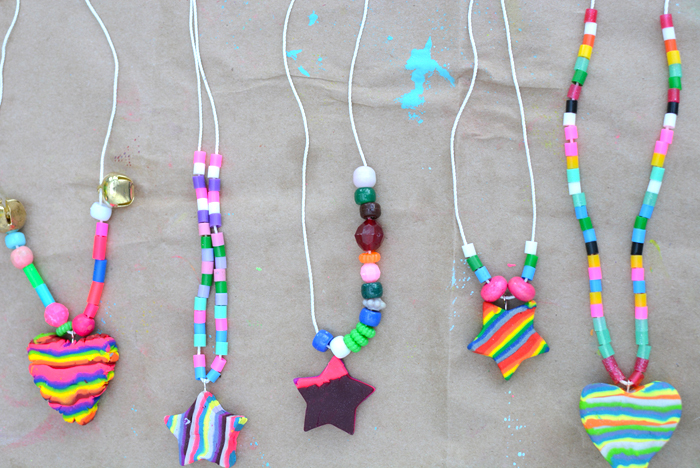 We made these rainbow necklaces with 5 and 6 year olds and the whole process was amazing from start to finish. The kids loved it. *This post contains affiliate links. Thank you for your support! 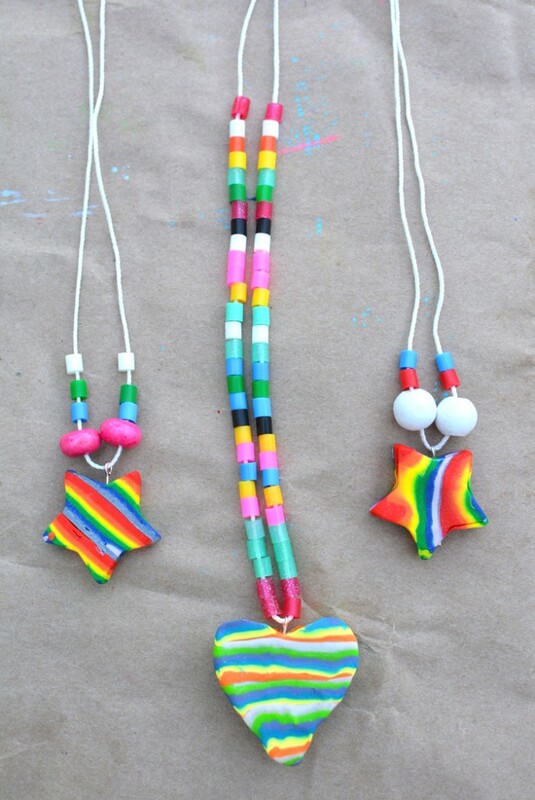 Each necklace was unique and every artist was successful. 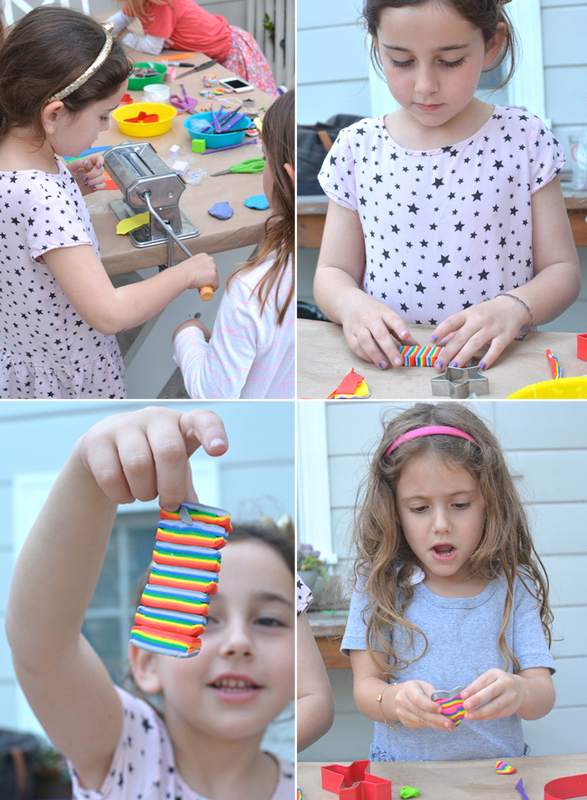 If you haven’t tried sculpey with kids yet, I can’t recommend it enough with ages 5 and up. Here’s how we did it and everything you’ll need to get started. 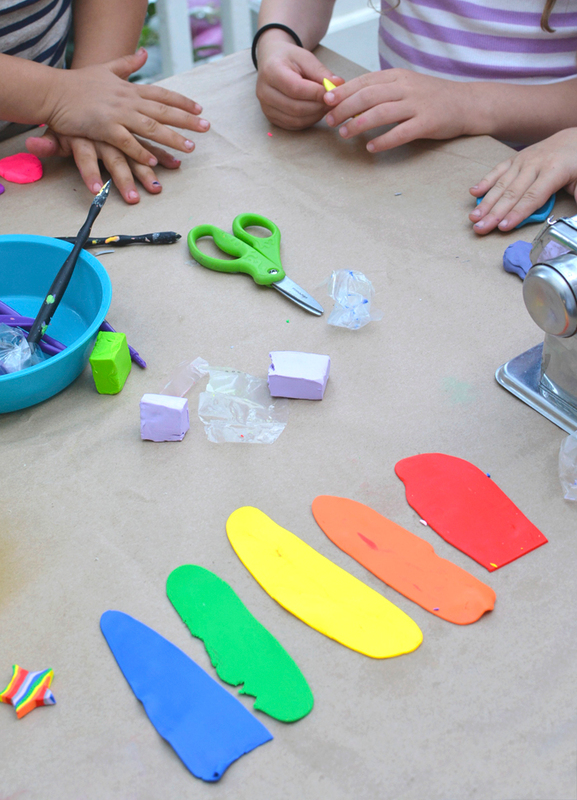 Decide what colors you want to use for your necklace and make a ball about the size of an avocado pit with each color. Flatten the balls like a pancake with your thumb and stick them through my secret weapon. 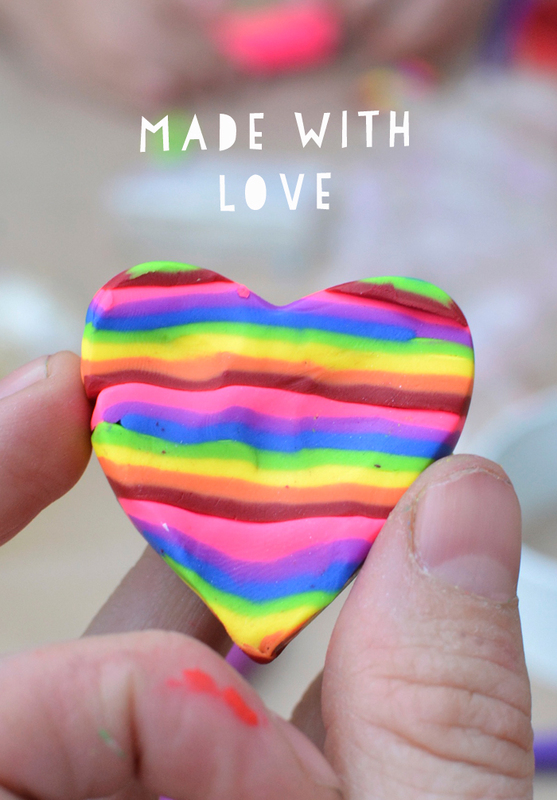 I call the sculpey craft machine my secret weapon because kids love it as much as ice cream, maybe even more, and can work with it for hours. It’s the best and well worth the initial investment. We’ve had ours for over 6 years. It’s the gift that keeps on giving. 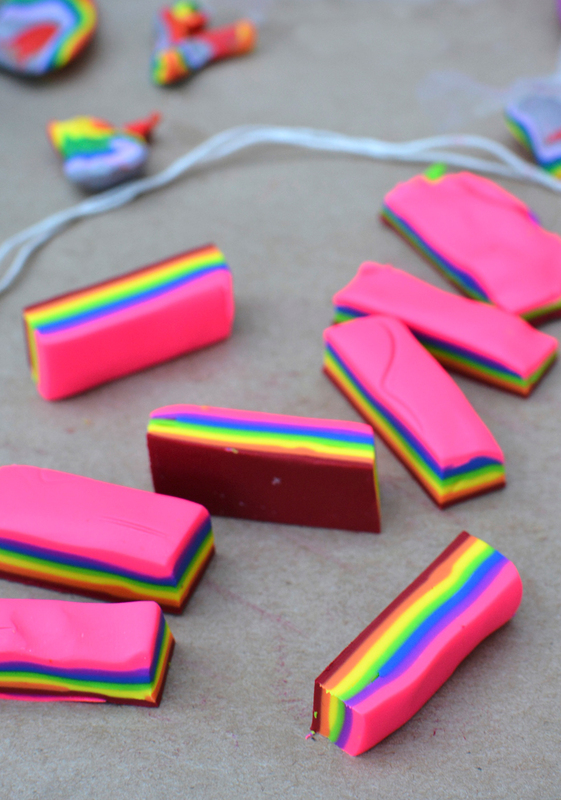 Once you put the balls through the craft machine, you’ll end up with some rainbow tongues, like you see below. Make as many as you want. If you don’t have a craft machine you can still do this part. Just use a roller and roll out the balls. No problem. Stack up the rainbow tongues in a pile. 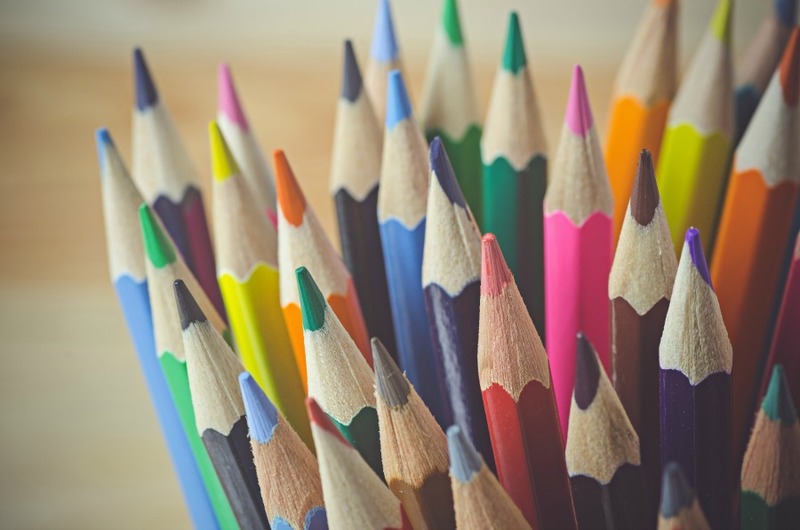 With an X acto knife, cut out a rectangle from your pile as big as the tongues will allow, meaning go up to the edge of the tongue so you can make a straight line with the knife. (I’d recommend adults only with the X acto knife. Safety first.) It will probably be about an inch and a half by two and a half inches. It doesn’t have to be exact. It just has to be wide enough for your cookie cutters. You’re going to cut slices in your rectangle about half an inch thick like you see below. Stack your slices one on top of the other. 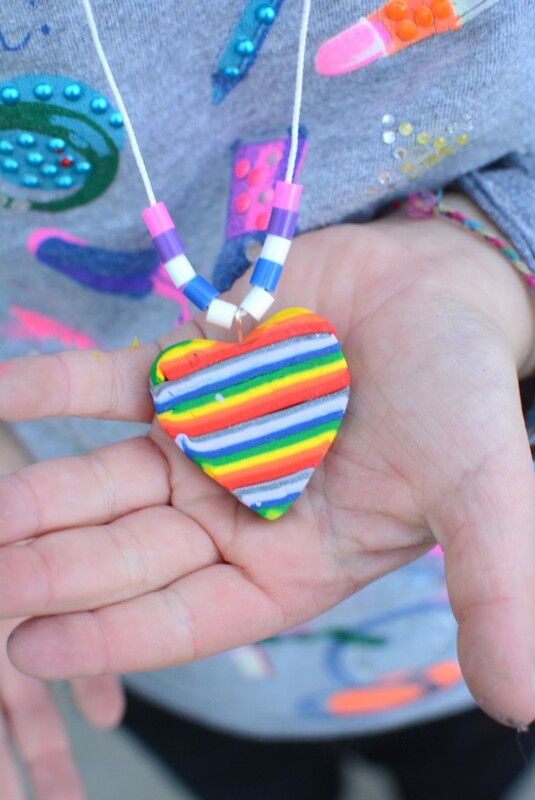 Lightly press them together so they stick and use the heart and star cookie cutters to cut out the desired shape from your rainbow stack. Some kids needed a little help getting their shape out of the stamper. 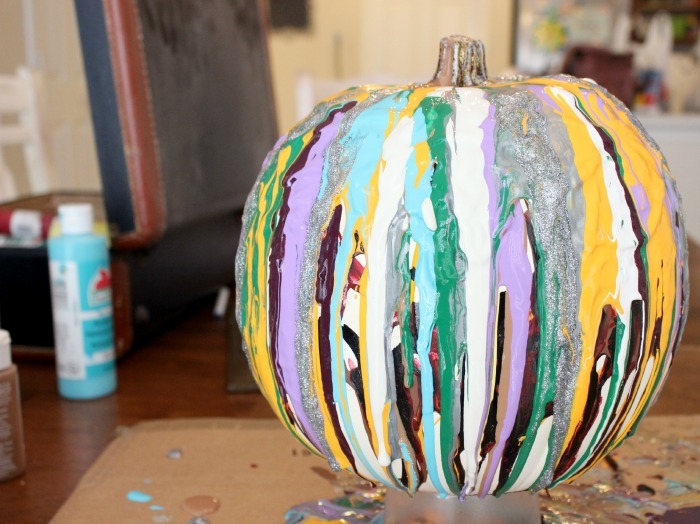 Just gently press it out by applying pressure to all the sides and it should slide out. You’ll be able to get at least two shapes out of your tongues. Take an eye pin and slide it in the center of the heart so you can string it on a necklace. You’re going to need to bake it first. Sculpey gets permanently hard after you bake it. Follow the directions on the back of your sculpey package for baking. The metal eye pin can bake right in there without a problem. Make sure the loop is on it’s side, not looking at you in a circle, before you bake it. 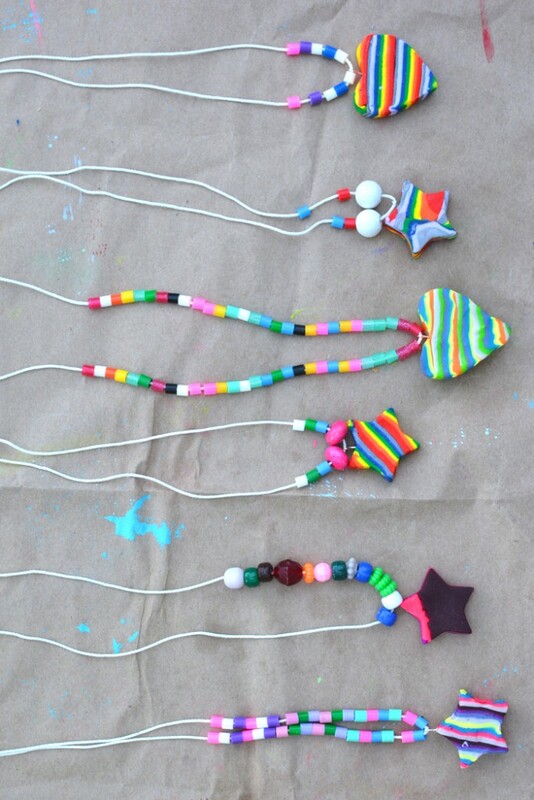 Bead your cord while the sculpey is baking. We wanted to make symmetrical necklaces so we put a little piece of tape in the middle of our cord and taped it down to the table. The girls beaded each side with the same beads. So, one red on one side of the tape, and another red on the other side and then just removed the tape when they were done beading. 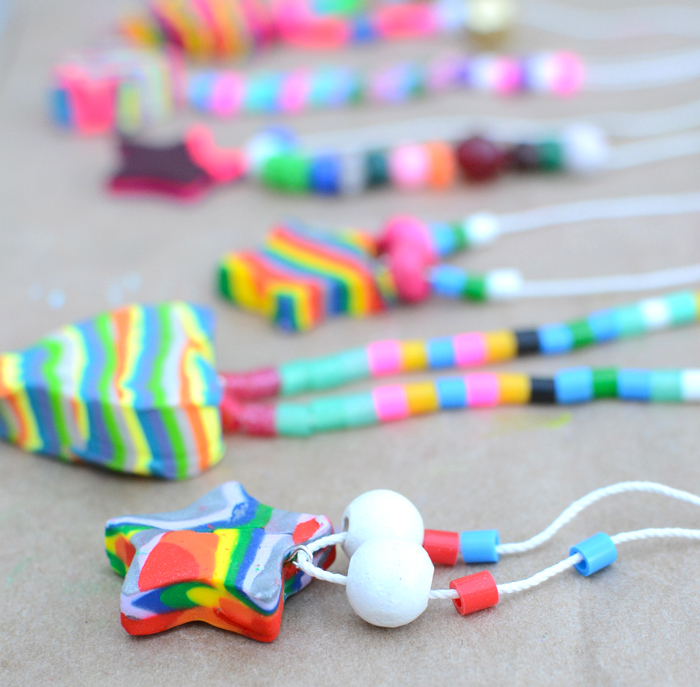 Attach the rainbow pendant between the first two beads by sliding the cord under the metal eye. I sort of hooked it on there and pushed down. If it’s easier you can wait until your pendant is baked, string it on your cord and then add beads on either side. That works just as well. Tie a knot by holding both strings together and tying a knot. Your necklace is ready for wear! Meri Cherry, yes that's her real name! 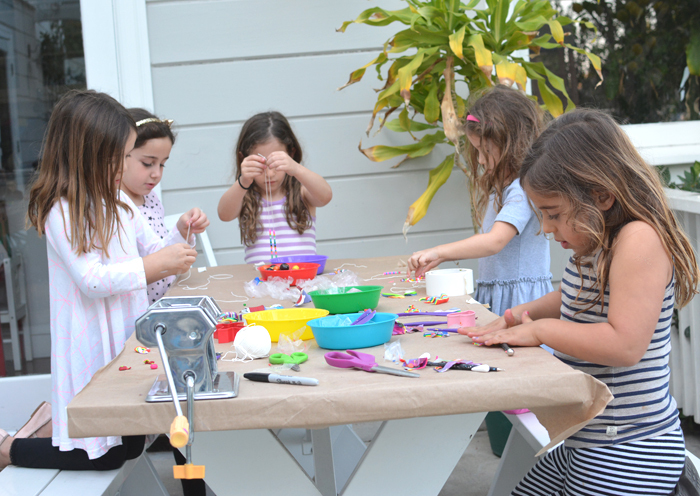 (isn't it fabulous) is a reggio inspired atelierista and private art teacher living in Los Angeles. She has two little girls, who are growing way too fast, and an amazing husband who builds things like THIS for them to enjoy. Her favorite things are Instagram, collecting way too many art supplies and stalking thrift stores and flea markets for the next best find.